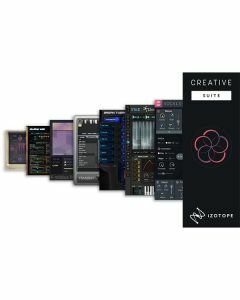 The iZotope Creative Suite features seven inspiring tools to invigorate your productions: VocalSynth 2, Iris 2, Trash 2 Expanded, BreakTweaker Expanded, Stutter Edit, DDLY, and Mobius Filter. The iZotope Creative Suite features seven innovative and inspiring software tools to invigorate your music productions and help them stand out: VocalSynth 2, Iris 2, Trash 2 Expanded, BreakTweaker Expanded, Stutter Edit, DDLY, and Mobius Filter. This unique collection of creative products is designed to inspire, elevate and aid exploration in your music. Make beats, design synths, add texture, and find your sound with the iZotope Creative Suite. Plug-in formats: VST 2 (32-bit and 64-bit), VST 3 (32-bit and 64-bit), Audio Unit (32-bit and 64-bit), AAX (64-bit), RTAS (32-bit), Audiosuite DPM and AAX. Graphics Card Requirements: A graphics card with Open GL 2.0 support is required to display the visualizations in VocalSynth 2. Plug-in formats: AAX (64-bit), AAX AudioSuite (64-bit), RTAS (32 bit), DPM AudioSuite (32 bit), VST2, VST3, and Audio Unit.